Holding aloft their searing crystal-adorned weapons, Chanters go forth into battle. Bringing succor to their allies and doom to their foes, their resonant songs herald both war and sanctuary. Harnessing the same force that nearly destroyed the world of Citadel three centuries ago, the Chanters are the inheritors of an ancient and enigmatic power. When the stars that once glittered in the heavens rained down in fragments upon the land, the Chanters were the first to take up the fragments and unlock their incredible powers. Chief among these powers is the ability to heal, or more precisely to reverse damage taken, reverting the subject’s body to its pure, whole form. Through the proper musical resonant frequencies and a correctly cut “sun-star” orange crystal, the Chanter is able to work this amazing feat. It is this mystical healing that Chanters are best known for. However, most people do not realise the true extent of a fully trained Chanter’s powers. The taming and channeling of the powers of the star crystals through voice and will alone is a centuries-old tradition. Indeed the new mechanomantic techniques of activating the stars are viewed as barbaric and vulgar by most chanters. It is the old ways of the Chorist Mystics that delivered the clans of Creminster from the doom of the marauding giants, and precipitated the founding of the Orthodoxy, the religion which presides over Creminster even still. “Choristry” is the general term for religions that revere The Song as the primal force of creation. To most of these religions, the sun-father (Xol), the four moons of Citadel (Esreth, Valencine, Lycaeis and Ardria) and the stars which once adorned the sky are all born of The Song. Though gods themselves, they are The Song’s servants. All Chanters, regardless of specific faith, can be described as Chorists of some variety. Faith in The Song is at the heart of Chanting, and it is through this faith that most Chanters produce their miraculous effects. Though not all Chanters can be described as Xolist, Xolistry is certainly the most widespread religion among chanters. Indeed, it was the early Xolist faith of Creminster in which Chanting was born. The common belief of Xolists is that The Song is an omnipresent force of good in life, but that Xol is the benefactor who actively intervenes in worldly affairs. Xol, therefore, is the focal point of worship, and the religion bears the hallmarks of monotheism. Under the banner of the Quatrinode Star of Xol, which represents the sun-father Xol at the center and the four “daughter” moons, the Xolist religions have spread to all corners of Citadel. Aside from the Creminster Orthodoxy, many denominations of Xolistry exist: From the fervent Dune-Nomad faith of the Poets of the Lamp in the distant deserts of the North, to the anarchic beliefs of Thornwood’s Brightrock Gang who worship the enigmatic Great Dreamer alongside Xol. As you might have guessed, Chanters are primarily a healing and buffing class. They keep their allies alive and enhance their effectiveness in combat. However, not content to lock any of our classes into just one role, we gave them potent abilities in other areas: tanking, crowd control and melee damage to name a few. 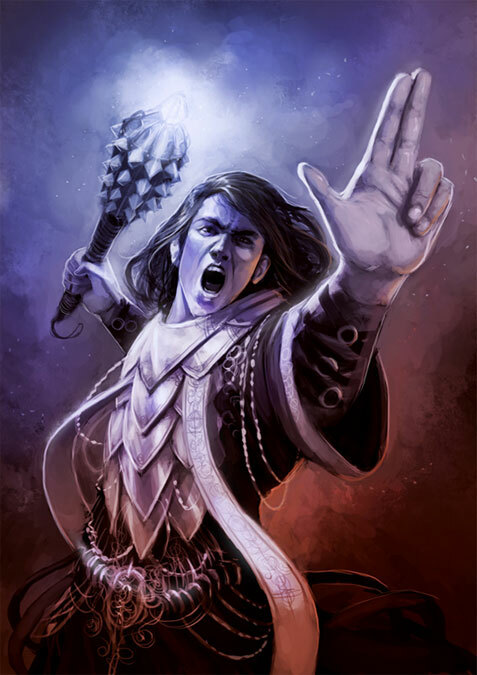 Chanters are flexible in this sense, but to use all these abilities effectively, one must master the core gameplay element of the class: Tones. Before a chanter may activate any class ability, they must sound one of the Five Sacred Tones. The Five Sacred Tones of applied Choristry correspond to Xol and the four goddesses. 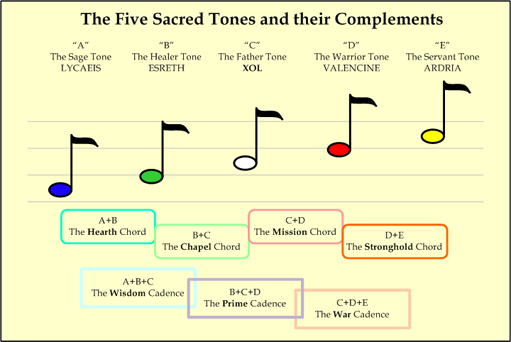 These in turn form the chords which represent the four Sacred Spaces, and the cadences of War, Wisdom and Righteousness (also known as the Prime Cadence). Hymn: A healing over time ability. Temper: A weapon enhancement ability. Chant: A group stat enhancement ability. Each of these abilities will gain benefits according to which tone was sounded. For example, a Hymn used under the Father Tone (C) will not only heal but remove Bleed and Fear effects from its recipient. Additionally, each tone unlocks an ability specific to that tone. For example, sounding the Sage Tone (A) will allow the chanter to use the Counterpoint ability which inflicts silence upon opponents. When the Chanter is more accomplished, they learn powerful abilities which can only be unlocked by sounding multiple different tones concurrently, a difficult but powerful technique which produces Chords (combinations of 2 tones) and Cadences (combinations of 3 tones). These grant access to startlingly powerful abilities, such as mass-healing and the ability to bring back fallen allies. The true power of the Chanter come to the fore when two or more Chanters combine their efforts, sounding chords and cadences with ease. Far from being an imbalanced group, a party consisting solely of Chanters is a terrifying force not to be trifled with! There is much more to the Chanters and their lore, but that is all we have time for this week. Tune in next week for another look at the game world. We’ll be looking at the seven Great Nations, giving you a taste of the civilizations that make up Citadel. See you then!